The lemon and blueberry tray bake and Eton mess layer cake feature seasonal summer berries and are perfect for a summer party. Enjoy! Preheat the oven to 180°C/350°F/Gas Mark 4. Lightly grease a 26x20cm baking tin and line it with baking parchment. Place the unsalted butter into a large mixing bowl, add the caster sugar and beat until pale and fluffy. Sift the self-raising flour and baking powder and gently fold it into the batter, until just combined. Stir through the lemon zest and juice and 200g of the blueberries until they are well dispersed, before spooning the mixture into the tin. Smooth the mixture with the back of a spoon then bake in the oven for 20-25 minutes, until lightly golden when a skewer inserted into the centre comes out clean. Set the cake aside to cool while you make the icing. Sift the icing sugar into a mixing bowl and add a couple of teaspoons of the lemon juice. Gradually mix the sugar into the lemon juice, adding a little more juice as necessary, until you have a fairly runny mixture. Stir through the lemon zest then drizzle over the cake. Scatter over the remaining blueberries and cut into 12 squares. The cake will keep in an airtight container for up to two days without blueberries on top. Preheat the oven to 180°C/350°F/Gas Mark 4. Grease and line three 20cm sandwich tins with baking parchment. Beat the butter and caster sugar together until the mixure is very pale and fluffy. Sift in the self-raising flour, ground almonds and baking powder then gently fold through the mixture until just combined. Stir in 1 tsp of the vanilla extract before dividing the mixture between the tins and smoothing the tops. Transfer the tins to the oven and bake for 30-35 minutes until the cakes are well risen and a skewer inserted into the centre comes out clean. Allow the cakes to sit in the tins for 10 minutes before turning them out on to a wire rack to cool completely. To assemble the cake, lightly whip the double cream with the remaining vanilla extract until it is just beginning to form soft peaks. Roughly crush 10 of the mini meringue shells and lightly stir them through the cream. Place one of the cake layers on a serving plate or cake board and spread over a third of the cream. Sprinkle on a third of the berries and repeat with the remaining cake layers. Top with the remaining meringues to serve. 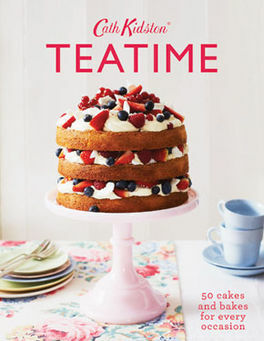 Recipes are taken from Teatime by Cath Kidston (£15, Quadrille), photographs by Rita Platts. To order your copy, call the Express Bookshop on 01872 562310, send a cheque or postal order, made payable to The Express Bookshop, to Express Bookshop, PO Box 200, Falmouth, Cornwall TR11 4WJ, or order online at expressbookshop.com.